Anika decides to make Shivay realize their love. She has realized her love for Shivay. She takes a new task on hand. She wants Shivay not to make any further mistakes. He asks her to sign the divorce papers. Shivay intentionally puts the wrong sign so that the divorce doesn’t happen. He also wants to stay married to Anika, but doesn’t accept it. She asks him why did she sign wrong, is there any feelings in his heart, if this is his intentional step, does he not want her to marry Nikhil. She hits questions on him. He doesn’t admit anything. Shivay asks her not to think anything. She tells him that destiny brought them together and now their pairing won’t break. She tries to open his eyes, but he acts ignorant. Anika becomes Khidkitod again. Shivay becomes her Billu ji once again. Their cute nok jhok begins again. She asks Shivay why is he compelling her to marry Nikhil. She refuses to marry Nikhil, since she is already married. She stops him from calling Nikhil. He says we have already spoken on this topic, you can’t stop me from calling Nikhil, maybe he can convince you. She says we have spoken on this topic and I told you that destiny will decide for us, you shouldn’t decide. She teases him by calling him Billu ji. He questions her on calling her Billu. She says I was going to marry Nikhil, but now I won’t remarry, do you want me to go to jail for dual marriage. He reminds that they have already signed the papers. She says you didn’t sign on it, some Billu has signed on it. She apologizes and shows the divorce papers, where he signed by Billu’s name. She asks him if he doesn’t care if she leaves his house by marrying someone. He tells her that it won’t matter to him. This angers her a lot. She throws water on his face. She says you have to admit that you don’t want me to marry someone else. She asks him does it matter to him now, after the water splash. The old moments of Shivika from Season 1 will be repeated. She calls him clever that he has signed wrong deliberately. She confronts him for expressing his emotions. She gets aggressive. Anika is sure that Shivay will admit his feelings. 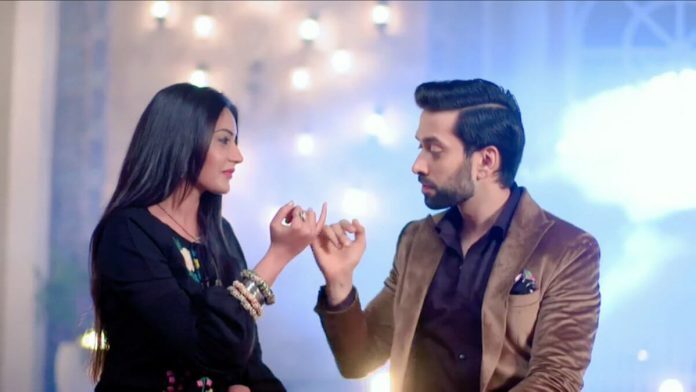 There will be new entries in the show, which will make a way for Shivika’s union. Anika gears up for the marriage, with confidence that Shivay won’t allow her to marry Nikhil. Priyanka, Omkara and Rudra don’t want Shivay and Anika’s divorce to happen. They will also out efforts to unite Shivika. Anika and Shivay will be getting married again.